Serving your refrigerator gasket needs. The refrigerator gasket is the flexible seal stripping around the outside edge of freezer and refrigerator doors that provides an airtight seal. Gaskets that become worn, brittle or cracked allow air to circulate past the insulated doors, warming the food inside, creating a greater potential for spoilage. Faulty gaskets also make the motor run overtime, wearing out the equipment early and raising your electric bill. How can I tell if I need new gaskets? Sometimes tears or loose strips of gasket material are obvious. Other times,units that keep turning themselves on or running nonstop indicate a problem. Often the problem is not so obvious. 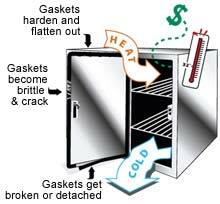 Over time, gaskets harden,and/or crack, fail to seal, and let the cold out. An expert inspection by The Northwest Gasket Guy can identify problem gaskets for you. ...and how much will it cost? The inspection is always free. When we find damaged or failing gaskets, well show you the problem and give you a quote. You can decide which gaskets to replace. Because we specialize in gaskets and door hardware, our prices will always be less than full-service refrigeration companies. Balanced against the expenses of wasted electricity and unneccesary food loss, it will save you money. We also do refrigeration hardware repairs. Handles, hinges, strip curtains, grill drawers, minor metal fabrication, stainless steel welding, and more! !